South Yunderup, Western Australia Sunday November 23, 2014 – The 2014 Hobie Kayak Bream Series National Championship presented by Daiwa came to a close today as 48 of Australia’s best kayak anglers tussled for, not only the prized title as the Hobie Kayak Australian Champion, but for a top ten finish. After a second solid day of action on the water in the tournament Chris Burbidge from Ferntree Gully in Victoria was crowned the new Australian champion.The day started at 6am on the Murray River, an hour earlier than day one. The Power-Pole starting line looked amazing in the overcast, early, morning light as anglers jostled for positions to take advantage of the crucial hours of fishing at the start of the day. Daniel Brown from Taree in NSW sat nervously on the starting line at the top of the Lowrance Leaderboard with his 2.34kg bag giving him a slight 370g lead over his nearest rival. Western Australia’s Brett Ozanne started the day in second on 1.87kg and eventual winner Chris Burbidge sat in third position on 1.67kg. The field of excited anglers pedaled off on the final day of the Australian Championship to execute the plans of attack that they had adjusted after yesterday’s fishing. Some headed further afield but in the same direction as yesterday, others stayed closer to the event site and many headed off to completely new locations. It was common for competitors to have covered more than 15km in the session with one Hobie kayaker pedaling his Hobie Pro Angler 12 over 25km on the day. As the grand finalists worked the early hours, the weather conditions had deteriated from yesterday. Rainsqualls, accompanied by wind gusts of up to 25kph and sudden cold snaps hit the arena. When the sun did brake through, mid morning, the cloud layer dissipated and the UV levels soared as the heat intensified. When the fronts passed and the wind subsided, the waves began a more rhythmic pattern out on the inlet. The rivers were covered in light ripples and glassy water glistened in the protected areas of the rivers and canals. For many the fish refused to strike early in the morning, including top ten positioned anglers who became panicky as fish resisted their presentations. 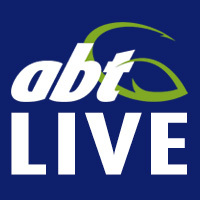 Most anglers thought that the bream would show their most aggressive nature early but some more technical based predictions suggested that the best bite time would be from 11am to 12pm. This is exactly what day one leader Daniel Brown was hoping for at 11am, when he had caught plenty of under sized fish but had no legals in his livewell. All over the arena the situation varied but the Black Bream in the upper Murray River where Burbidge had ventured where taking lures through most of the day and a lot of anglers who headed in that direction came home with full bags. It was the same direction that a pod of dolphins, which frequent the river, also chose to head to as they passed through the field of anglers as the tournament kicked off. They were heading back past the Daiwa Event Site at 1pm striking fish, making the water boil, in amongst the snags and riverbanks on the way back through to the inlet. The dolphins knew where the fish were and the best times to target them. When the anglers returned to the Atomic Launch Site many were happy with their bags, some just happy not to have come home empty handed two days straight and others were excited about their prospects. Daniel Brown though was dejected as he pedaled to shore with no fish in his well, the day one leader and two time champion was out of the running for a spot on the podium. Burbidge stood at the Berkely Bump Tub watching as angler after angler went up on stage. Finally, it was his turn to walk down the green carpet of the Rhino-Rack Runway and up the stairs and onto the stage in front of the 200 strong crowd gathered to watch a Hobie tournament weigh-in.Burbidge was the second last angler to weigh-in his bag of three fish and was excited as he took over the “Hot Seat”, (the seat on the stage reserved for the current leader as the weigh-in progressed). He remained reserved, but with nervous anticipation he looked on as Brett Ozanne came up on stage for the final weigh-in of the tournament. When Ozanne came to the scales he needed a bag weight on the day of 1.4kg to take the title. His three bream, mostly taken in the canal just 1.2km west of the Daiwa Event Site, fell just short at 1.25kg and Burbidge pumped his fist in the air, ecstatic with his victory. 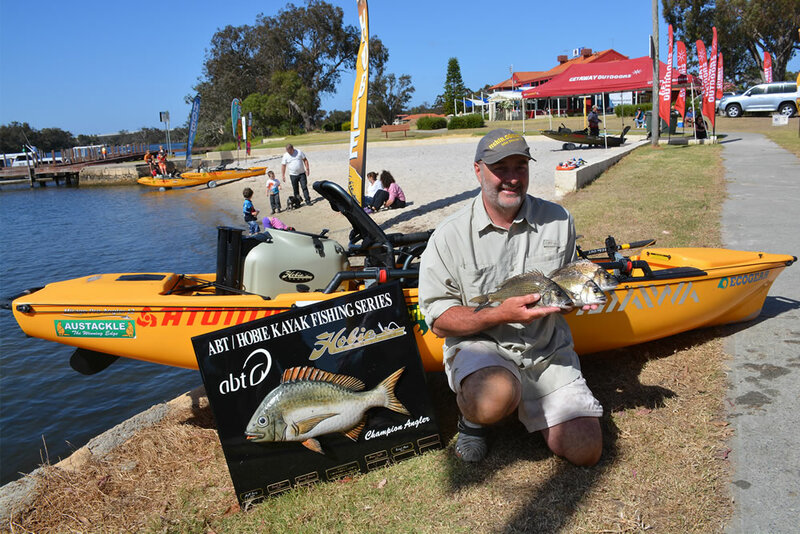 After a great year on the water including three tournament victories, the 2014 Hobie Kayak Bream Series Australian Championship title was now rightfully his. After the presentation of the championship trophy in front of a large crowd of onlookers Burbidge offered his thoughts on his performance and on the tournament. “To make it to the grand final I had a few performances I was pretty happy with, I won three tournaments this year, Paynesville, Lake Tyers and Nelson the very first round at the beginning of the year. When the tournament here got off to a start on Saturday I had a pretty good day, I didn’t think I had done enough but I ended up in third place. I just did what I know to do around structure, which is to use deep diving hardbodies and little 40mm vibes. Today I started off with exactly the same lures and all I was getting were those Spangled Grunter or whatever they are called. I got about 15 of those and I thought, ‘This area’s not working now’. My first fish didn’t come till about 9:30 or 10 o’clock in the morning so I was starting to hit the panic button. My finger was sort of on it. So I went well up the river and ended up putting on a purple vibe, just in desperation. About three casts later I was into me first fish and it just went on from there and I kept doing that all day. Slow rolling it, fishing structure, fishing drop offs. It didn’t matter what I was casting at I was hooking fish. I only got busted off once today, so I was pretty happy with that. But the vibe did the job for me again; it turned out to be just a fantastic day. This is just an awesome place, with all of the timber and structure up the river as far as we went there was timber everywhere. So much so that you just don’t know where you’re going to start to fish. Down stream there’s timber, there’s pontoons, there’s wharves. Awesome, it’s an absolutely awesome place. It’s even more special now that I won the Australian Championship here. Hobie tournaments are always well run and this tournament is no exception. Steve (Fields) always does a great job, as does his backup crew. They drove over here from the east coast dragging the event trailer behind and got this place looking immaculate. I heard there were snakes in the grass when they got here the grass was knee high. The job the Hobie team has done is awesome”. A purple vibe, slow rolled, fishing structure, fishing drop offs. It didn’t matter what I was casting at I was hooking fish. 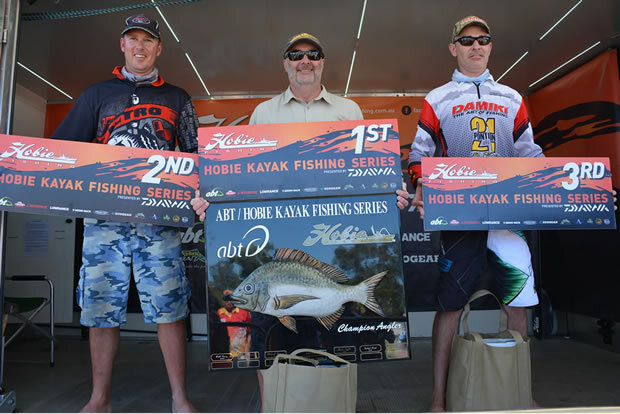 After a brilliant two days of fishing, second place in the Hobie Kayak Bream Series Australian Championship went to exceptional Western Australian angler Brett Ozanne, who maintained the second place he held at the end of day one. “I came into today quietly confident, I suppose. I knew it was going to be tough today but I thought that local knowledge would come into play and the local guys would get a bag and some of the east coast guys would have a bit of a struggle to get three fish. But with guys of the calibre of Chris Burbidge, they can always pull one out of the bag and they did. I’m absolutely pumped with the whole weekend. I pre-fished pretty extensively and I was fairly confident coming into the comp and wasn’t really thinking about really competing against anyone but myself. I had nothing to lose and it came off, two full bags which were really what I wanted to get, two full bags. I was absolutely stoked. I basically used the same technique all weekend. I found fish on the little shallow flats on the canal system where there was a clear layer of sand over a dirty layer and they were puffing up all over the sand, so I could see them. I worked the Atomic crank over the flats, I kicked up a bity of dirt with it, here and there, to get the fish’s attention and then I gave it a pause and a twitch and they jumped all over it. That pretty much worked all weekend. It was just a matter of finding the fish in the canal and when I did they were really flighty, even when I stood up in the Hobie they would get spooked. I just found a couple of really good patches and probably pulled most of my fish from one 50m stretch. That fished pretty well all weekend until it shut down about 10:30 today. I went into the flats in the canals this morning chucking an Atomic Crank, my last Ghost Gill Atomic crank after yesterday snapping the bib off one on a fish and losing one to a little Chopper Tailor. I came up to my flat at the end of a jetty, and pegged it under the jetty and got a fish. I couldn’t turn the PA back in time; I free spooled and lost the lure. Devastated, I tied on a Muddy Prawn but I just wasn’t feeling it. I came back to that jetty probably forty minutes later only to find that Atomic Crank of mine floating on the surface under the jetty. I couldn’t believe it and what was even better, I caught my last two fish on that Atomic Crank. I’m absolutely stoked I came second. Better than I could have hoped and to do it for WA, I’m absolutely rapt”. Third place went to Queenslander Michael Maas from North Gold Coast. “It is a bit different from home coming here, so I wasn’t expecting to catch my bag each day. But I sort of just fished it the way I do back home and it paid off. I pitched 2 ½” Damiki D Grub on 3lb leader into the trees, into the timber. There’s just that much structure here you miss a fish on one and you just go to the next one and pitch away again and you just keep getting them. I got twenty legal fish today but yesterday I only got five. It was a lot better for me today and I wasn’t expecting that either. I was seventh coming into today and getting a podium is just unbelievable. I loved coming here with all the timber and the river. I love fishing all of the natural structure, back at home too. It reminded me of a place I love to fish at home, Jumping Pin, with all its timber and mangroves. I had to adjust, a little bit, to the fact that there was no real tide here. Being from Queensland we get 2 metre tides, so there’s a bit of a difference there. But I just downsized the plastic and downsized the jighead and it just worked. Hobie events in Australia are awesome. I fish the boating events and the kayak events but I think the kayak events might be up above the boating events at the moment, the way they are run and the way they are organised. The guys just do an awesome job and the venue here for this championship was awesome, what else can I say. I just loved being here”. For the first time in the championships two anglers brought fish to the scales that weighed in at exactly the same weight. On day one Daniel Brown from Taree in NSW brought in the largest fish of the day coming with a 1.06kg Kegger, which he pulled in from the lower reaches of the Murray River. On day two Jim Barrie from the NSW south coast town of Nowra caught another Bag Kicker in the upper reaches of the estuary also weighing 1.06kg.